Getting the skinny on New York City sample sales is not nearly as difficult as it used to be, which can pose a problem for someone who loves a deal as much as I do. This past week Parker, Reiss, Zadig & Voltaire, and many more brands worth blowing your budget for were having sales, but a girl has got to be selective. I decided to just hit Parker, a brand that is “for the city girl in all of us.” They have long been a favorite of mine for their flirty dresses and date-night tops (which, in my day were referred to as “going out tops” and were purchased on a weekly basis at F21 so you could toss them without guilt if someone puked on you at The Green Turtle – where are my Maryland people at?) and they added “Parker Black,” an evening line label, back in 2014. With two weddings (one of which is in three weeks!) and a cruise with my in-laws coming up, this was my sale. 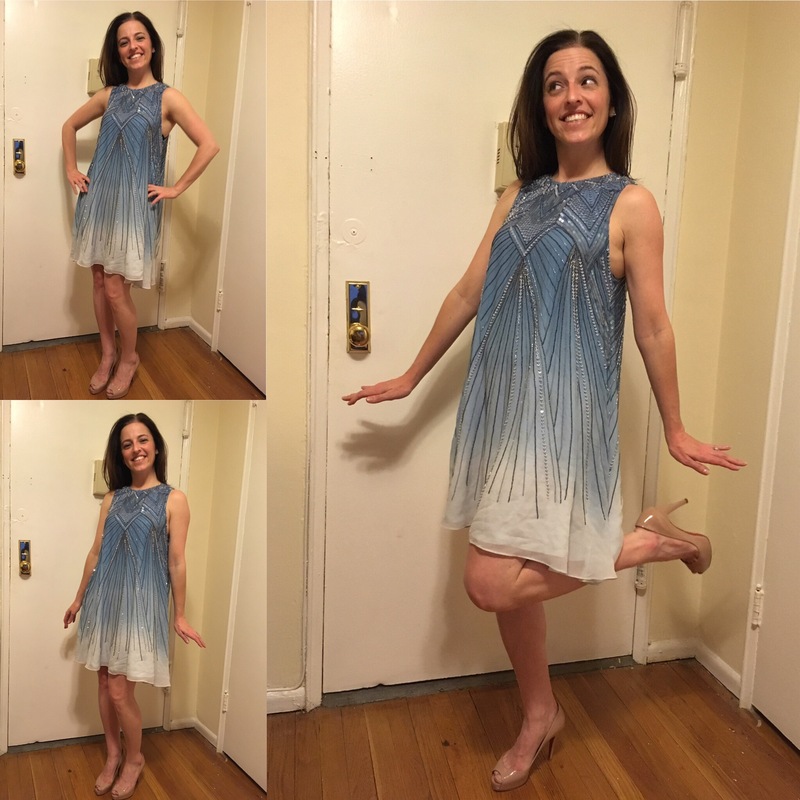 The selection was huge – tops, rompers, shorts, skirts, dress – each category offering items with various amounts of beading, from none at all to Vanna White. My inner magpie was in her glory, it was really hard to remind myself that I’ve been trying to pare down my wardrobe lately (dammit, KonMari!). Halfway through the sale I assured myself that I had found exactly what I needed and went into the “dressing room.” If your idea of sharing a dressing room means telling your bestie that she can come in with you, then a sale like this may very well traumatize you. Dressing rooms tend to be fences of rolling racks draped with fabric; inside women have varying comfort levels when it comes to getting changed, so be prepared to see a lot of brightly colored pairs of Hanky Pankies (they truly are one-size-fits-most). Oh, Going-Out-Top, how I have missed you. It is so much easier to spend $90 on you when I know that I will most likely be wearing you to dinner instead of a smoky bar (I went to college in Maryland in the early 2000’s when you could still smoke in bars – a dry-clean-only tag was a non-starter). This top can be dressed down with jeans or dressed up with fabulous white pants for summer nights in the Hamptons. This dress makes me feel like a beautiful figure skater from the 1920s (I’m sure they dressed differently than this, don’t ruin my fantasy). It’s fancy and fun, but also light and comfortable. I cannot wait to wear it. And now for the pièce de résistance – the ball gown. Next month we have a black tie wedding for a dear friend who has the most discerning taste of anyone I know. Needless to say, finding the right dress has been daunting. I had just decided to borrow a gown from my sister when I found this. 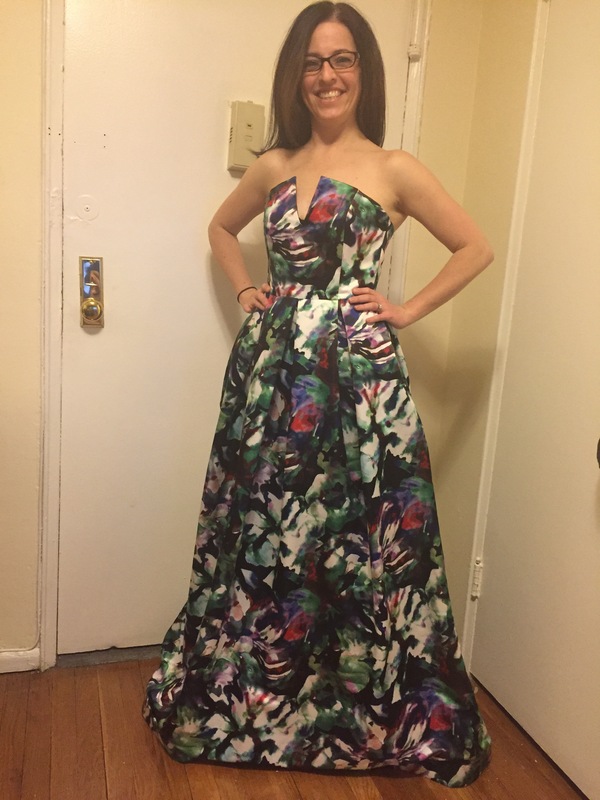 It fits like a glove (minus the hem, but at 5’1″, that is to be expected on any full length item) and I feel like a work of art. When I got home I immediately tried it on for V. Before walking out I said, “I want your genuine honest opinion, but I really love it.” No pressure, right? Thankfully he loves it too. Now I just need to decide on accessories, hair, and make-up. I would love to hear your suggestions in the comments! Just read a good portion of your blogs. You are awesome, but you knew I already felt that way! Bravo!! Oh my goodness, I am so behind on posting that I am just seeing this now. Thank you so much, Mimi!